TBILISI, DFWatch–Jehovah’s Witnesses in Georgia claim that they are being discriminated against on religious grounds in Terjola, western Georgia. 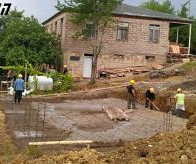 In June, locals protested against the new house and the local government decided to halt construction work. Jehovah’s Witnesses then sued the town administration (gamgeoba) in Zestaponi Court and won. The decision is not enforced yet, as the gamgeoba is preparing to appeal. Head of Saint George’s Church in Terjola, Spiridon Tskipurishvili, claimed that someone is trying to provoke a confrontation and make it look like church leaders are persecuting Jehovah’s Witnesses in the eyes of international organizations. The gamgeoba has offered Jehovah’s Witnesses a different location for the hall and also offered to mediate in the conflict. Jehovah’s Witnesses has been threatened and attacked numerous times in Georgia, and according to human rights workers the authorities are rarely prosecuting such incidents.